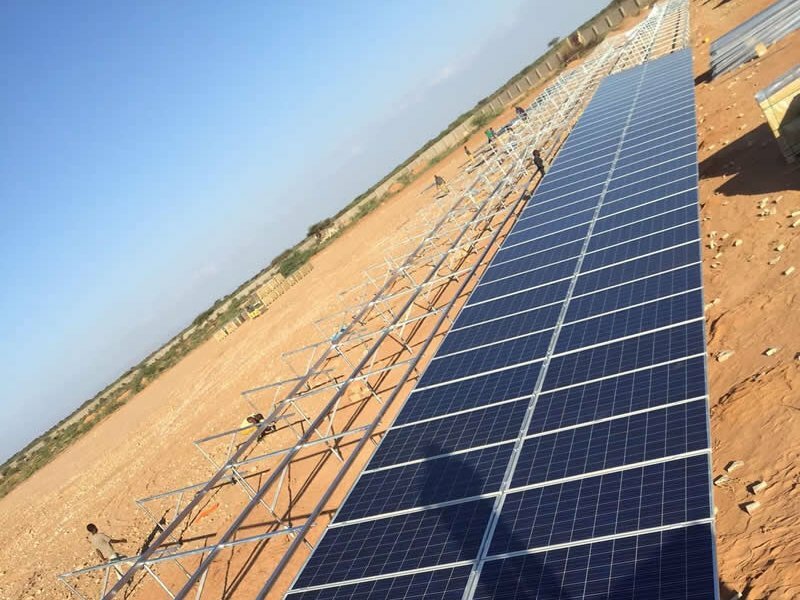 The system consists of PV modules, ground-mounting systems, DC cables, DC string boxes, central inverters with transformators and systems with a fuel save controller. The system’s design suits installation into local grid with existing fuel generator units. The fuel save controller manages the performance of fuel generators according to the grid demand and the power supply from the PV system. Fuel generators are used only if the PV system does not produce enough electricity. In many regions of the world, power grids are either inadequate or nonexistent. As a result, industrial consumers often ensure their power supply through diesel gensets. Five hundred gigawatts of power from diesel genset provide industrial companies with electricity worldwide. However, fuel costs for the gensets continue to rise. The price for one liter of diesel has already exceeded one US dollar. In addition, if the fuel has to be transported to remote regions, the effective costs increase even more as a result of the necessary storage. 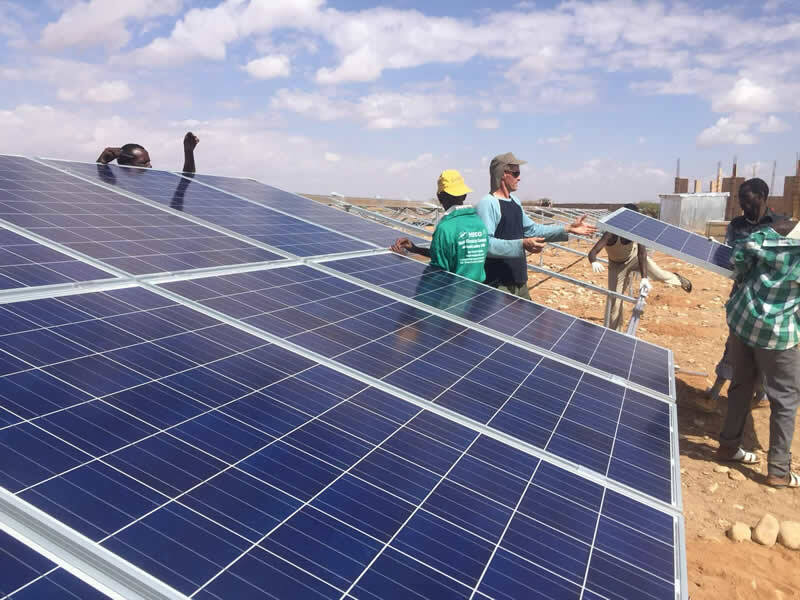 At the same time, PV system costs have dropped by more than 50 percent within the last three years: Solar power is often the most economical alternative energy source for remote regions in the world’s sun belt. It simply makes sense to combine PV and diesel systems so that solar irradiation – which is both abundant and free – can profitably be used as an energy source in industrial applications. In November 2012, the first off-grid photovoltaic diesel hybrid system in the megawatts went into operation in Thabazimbi, South Africa. Using the Fuel Save Solution, the system complements the existing diesel energy supply with solar energy. The operator can save up to 450,000 liters of diesel per year and significantly reduce CO2 emissions. But how does that work? And what exactly is a photovoltaic diesel hybrid system? What is a photovoltaic diesel hybrid system? A “hybrid” is something that is formed by combining two kinds of components that produce the same or similar results. A photovoltaic diesel hybrid system ordinarily consists of a PV system, diesel gensets and intelligent management to ensure that the amount of solar energy fed into the system exactly matches the demand at that time. How does a photovoltaic diesel hybrid system work? Basically, the PV system complements the diesel gensets. It can supply additional energy when loads are high or relieve the genset to minimize its fuel consumption. In the future, excess energy could optionally be stored in batteries, making it possible for the hybrid system to use more solar power even at night. Intelligent management of various system components ensures optimal fuel economy and minimizes CO2 emissions. What are the advantages of a photovoltaic diesel hybrid system? 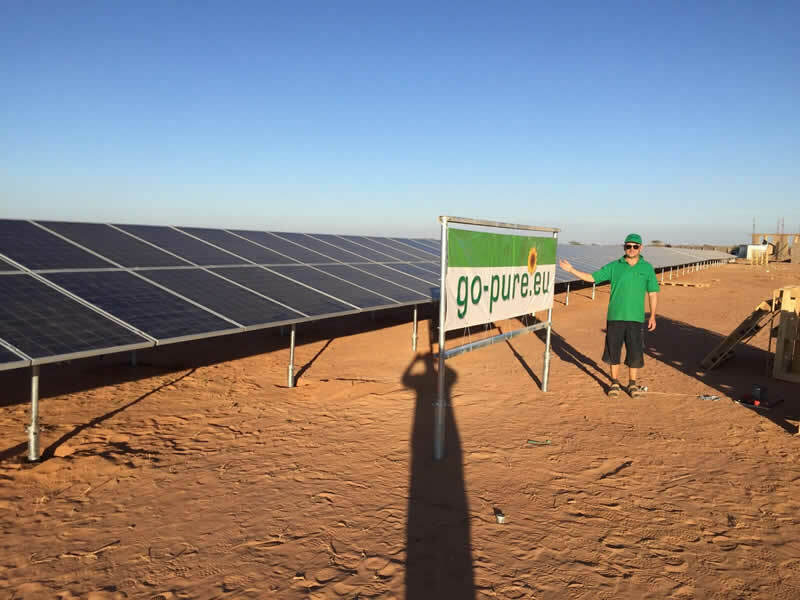 In contrast to power supply systems using diesel gensets, and despite their higher initial cost, PV systems can be amortized in as little as four to five years, depending on the site and system size, and they have low operating costs. VONSCH’s solution for photovoltaic diesel hybrid system technology is the VONSCH Fuel Save Solution. The information provided below explains how it works and you can learn other interesting facts. What are the components of this photovoltaic diesel hybrid system? VONSCH Photo central inverters are the central components of the VONSCH Fuel Save Solution. Designed specifically to be used in weak utility grids, they are suitable for high voltage and frequency fluctuations. They also remain extremely productive in harsh ambient conditions such as heat, moisture, salty air, dust, among others. Both the Photo central and the Photo control can be used in a photovoltaic diesel hybrid system. A centralized PV system contains only one string into a central point (here VONSCH Photo Central) where direct current is converted to alternating current. In a decentralized PV system, the PV power is divided into many strings, which are converted into alternating current by several central inverters. Both the VONSCH Photo central and the VONSCH Photo control work with the VONSCH Fuel Save Controller to perform grid management functions. The choice between a centralized or decentralized system depends on many factors. Both system installation costs and operating costs must be considered. For example, maintenance work on a decentralized system is not complicated, even in inaccessible areas. If service is needed, local electricians can replace individual inverters. However, remote monitoring is simpler for a centralized system structure. The solar power is generated in the PV modules, which can be mounted on the ground or on a roof, depending on local conditions. VONSCH inverters are compatible with all PV module types and technologies currently available on the market. Controls PV power injected into the Diesel grid. Provides optimal PV feed-in capacity by evaluating current genset and overall load status. Records and transmits data and setpoints as the interface between the PV Main Controller and inverters. Quickly and precisely analyzes the current load and grid conditions in the system and transmits the data to the PV Main Controller Module. In grid-remote regions, pure diesel systems often provide the energy for industrial applications. They constitute the local grid, ensuring a constant power supply to all connected users. Because the gensets require a constant fuel supply, they are often the system’s highest operating cost. In regions with weak utility grids, diesel gensets often serve as a backup during grid power outages. This includes the monitoring and control systems for the diesel gensets. The genset system house is the central terminal and point of common coupling.outages. To boost the efficiency of the entire energy supply system, it is advisable to include a storage battery. When solar irradiation is insufficient or energy is needed after dark, the storage battery supplies the required energy, ensuring optimal hybrid system operation. VONSCH is working on a GSEi battery inverter specifically designed for such industrial applications. Application specific load profiles, e.g., heavy duty industrial loads for mining or processing raw materials as well as for agricultural use, are generally characterized by loads with high starting currents and widely fluctuating load curves. Intelligent system management ensures that generation and load are perfectly matched. It achieves constant system stability by reacting quickly to generation and load performance spikes, e.g. when a conveyor belt is turned on. When and where does a photovoltaic diesel hybrid system make sense? When the effective cost of diesel exceeds one US dollar per liter. 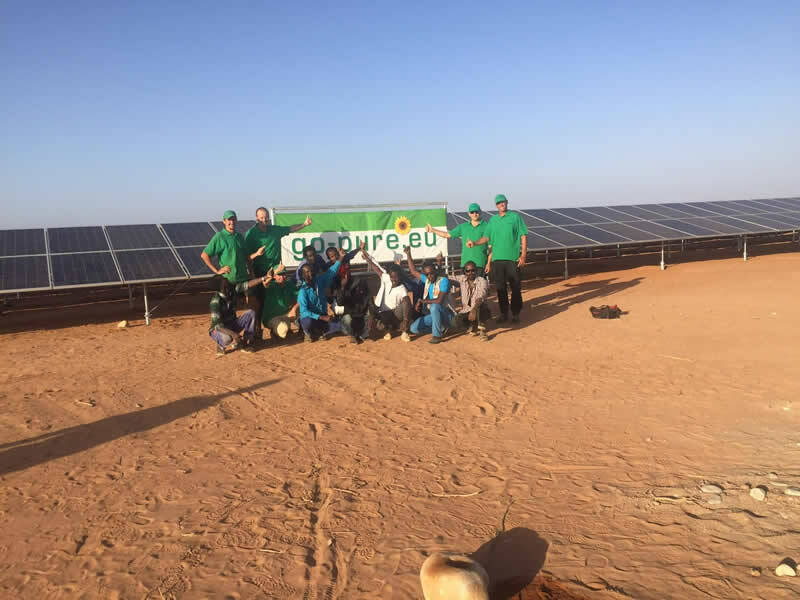 When intelligent communication between the genset and PV systems facilitates demand-oriented use of PV power. Photovoltaic diesel hybrid systems can be amortized especially quickly in sunny regions, with little or no grid access. 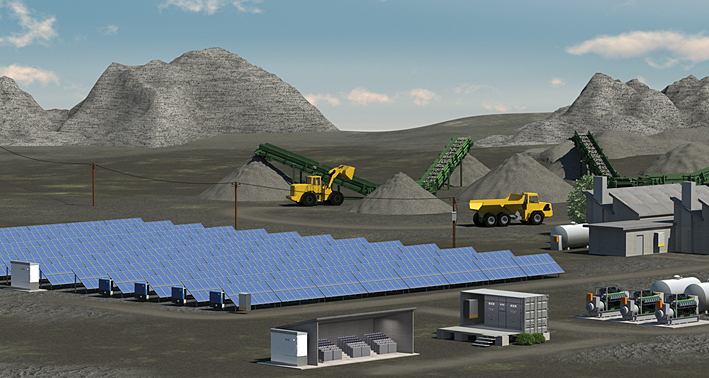 VONSCH system technology maximizes the use of solar energy in combination with diesel aggregates. For industries such as mining; raw material processing; agricultural companies such as flower farms and water desalinization systems and tourism facilities with a high energy demand low power generation costs, quick operational readiness, maximum reliability and availability are fundamental. The environmental benefits are also convincing: CO2 emissions and noise pollution are significantly reduced, minimizing the environmental impact. Environmentally friendly and cost-effective? Yes, we can do that.